Archaeologists have identified a remarkable piece of Neanderthal jewelry comprised of eight white-tailed eagle talons. Worn 130,000 years ago, the discovery shows that Neanderthals were capable of making sophisticated ornaments long before modern humans appeared on the scene. 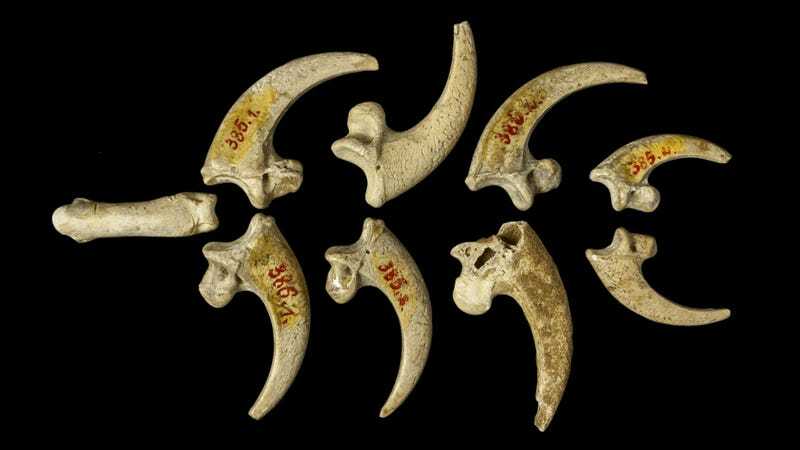 This item of jewelry, found in a former Neanderthal cave more than 100 years ago, consists of talons with multiple, edge-smoothed cut marks, with all of them exhibiting signs of polishing or abrasion. Three of the talons feature small notches at roughly the same place along the surface. "These features suggest they were part of a jewelry assemblage," note the researchers in their study, which now appears at PLOS One. "[The] manipulations a consequence of mounting the talons in a necklace or bracelet." The talons were all discovered at the same sedimentary level at Croatia's Krapina cave, a site known for Neanderthal remnants. The pieces came from multiple eagles, which suggests the Neanderthals were collecting and curating eagle talons for some kind of symbolic purpose. Finding eagle talons is not easy, so the item may have been the product of meticulous collection. Alternately, Neanderthals could have hunted eagles — though how they coulod have accomplished such a feat is unknown. The discovery also shows that Neanderthals were not the brutes they're often portrayed to be. "Some have argued that Neandertals lacked symbolic ability or copied this behavior from modern humans," conclude the study authors. "These remains clearly show that the Krapina Neandertals made jewelry well before the appearance of modern humans in Europe, extending ornament production and symbolic activity early into the European Mousterian." This piece of jewelry was manufactured approximately 80,000 years before modern humans appeared in Europe. Read the entire study at PLOS One: "Evidence for Neandertal Jewelry: Modified White-Tailed Eagle Claws at Krapina".